Since my website was launched during September of 1998, the dialog that began with the fans of my recordings has been one of the most wonderful benefits of this age of rapid communication. Of course, music fans always want to know what an artist, whose opinion they might value, thinks of the work of other artists, especially those who play the same instrument. In this case, we would be speaking about the guitar. Though I might have strong opinions about what others might have done, if I don't have something positive to say, usually I just try to be polite, and dance around the question. But, in general, I am not a fan of music that sounds like guitar music to me. What I do enjoy and appreciate is music that is made for the joy of music-making, and, if that music happens to be led by a guitarist, then that would be welcomed by me. Fortunately, there are many superb guitarists who are involved in music and music-making like that. 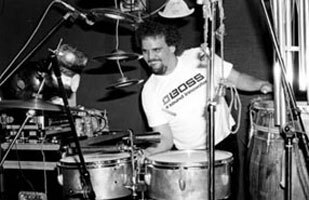 Since the group Eyewitness was formed in 1981, I believe that my sole goal has been to be seen as a music-maker as opposed to a guitarist. So, one of the reasons, that "Modern Times" is one of the last of the tunes from the body of work that spanned the three albums recorded by the original group: "EYEWITNESS"('81); "MODERN TIMES"('82); and "CASA LOCO"('83), is that, for me, as a composition, it tends to exemplify exactly what I wouldn't want to be doing! 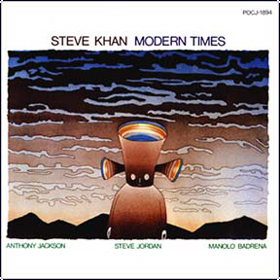 Were it not for the singular brilliance of my bandmates: Anthony Jackson(Contrabass Guitar); Steve Jordan(Drums); and Manolo Badrena(Percussion), I don't know that I would have ever bothered with presenting this tune here. But, their contributions, and the fact that, after many, many years, the album, "MODERN TIMES" has now finally been made available via iTunes and other legitimate digital downloading services, sharing this tune becomes a celebration of that event. Though this story has been told at several other pages at the website, perhaps it bears one last retelling? After having recorded "EYEWITNESS" during November of '81, the next step seemed obvious, "Let's go to Japan and play some of this music!" Our advisor/promoter, George Braun, told us that the only way people would really believe that this was, in fact, a 'real' group was if there was a 2nd recording! That, at the very least, might do it! 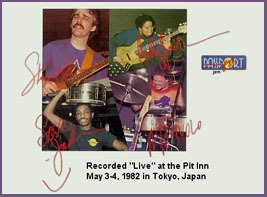 And so, arrangements were quickly worked out with the famous Pit Inn in Roppongi, Tokyo for a series of concerts in early May of '82. But, more than this, we had locked ourselves into a 'live' recording, for Trio Records, of our very first time playing this music in front of people!!! ¡Susto! ¡Qué miedo! How crazy was that? By that time, it was too late to turn back! As the group only had the five tunes from the first recording, I suddenly was 'under the gun' to compose new pieces, not only for the performances, but to record. We were told that between the two sets, the first audience would be cleared, and that we would have a new audience for the 2nd Set. But, when we got there, we were told that they were going to allow the same audience to stay for both sets. Disaster! How were we going to make the same 9 tunes, plus a couple of odd-ball standards, keep the audience's attention? And so, the live LP would feature only the 4 new tunes that we had brought with us, they were and are: "Blades"; "The Blue Shadow"; "Penguin Village" and "Modern Times." Because this particular recording featured only four tunes, and each one was between 10-11 minutes in length, the only U.S. label interested in picking it up was Passport Jazz. The reason being that, they needed 'product' to launch the label. With track timings of that length, it obviously means that there will not be huge amounts, if any at all, of radio airplay. So, that anyone wanted to release the album was just a matter of good fortune for me. Otherwise, it might have never been released in the United States. However, for the release here, we had to change the title to "BLADES" because Mike Mainieri's Steps Ahead had just released a recording titled, "MODERN TIMES"(Elektra Musician) as well. To top this all off, in one of my all-time most stupid moves, I allowed my then lawyer to talk me into 'retaining' the CD rights, so that he could shop the album in CD format to another label. What a moron I was for listening to that sage counsel. If no label wanted it as an LP, why would they want it as a CD? I should have simply let Passport Jazz have the entire package. This one ill-informed decision created a disaster that would last decades for me, as the only CD release took place via Polydor K.K. (Japan), and though some imports were certainly shipped around the world, those numbers were not great. And so, fans of this group have been dying to have this album, and could never find it. My own personal feeling is that those beloved fans are mostly electric bassists and drummers, who worship the work of both Anthony Jackson and Steve Jordan in the context of this group, and rightfully so!!! Now, let's try to take a look at the specifics of this tune, with a bit of historical perspective thrown-in as well. It's hard to believe that 1982 was some 30 years ago, and the most popular group in the world was The Police! At that moment, their most recent release had been "GHOST IN THE MACHINE" and Steve, Manolo and I were all huge fans of that group's music. We loved the attitude and the mood that their songs conveyed, via Sting's voice, Andy Summers' guitar textures, and Stewart Copeland's powerful drum sounds and feels. Our group composition, "Modern Times" was, in essence, jammed-up at Steve Jordan's downtown New York loft, and it remains so ironic that Anthony Jackson, the one person who knew little or nothing about the music of The Police, and his unique contributions to the piece are injected totally by his musical instincts more than any sense of capturing that style of music. In the end, that's a great thing, because it gives our piece an even more unique perspective. As the Intro, the [I] section, begins, from the perspective of the guitar, this would be the most obvious tribute to The Police. Of course, the great difference would be that I don't believe that they would have ever spent a 1:42 Intro over an Am6/B chord, or a B Phrygian sonority! In concept, the idea is that Anthony is soloing/improvising and, via a long crescendo, he is leading the group towards the [A] melody section. This is where, from a compositional perspective, being self-critical becomes obvious, as there can't be two more basic and simplistic open-string guitar voicings over an E7 than these two. Anthony's choice of notes becomes the only real point of interest, apart from Steve Jordan's energetic, emotional, and physical drumming. The little G2 chord voicing on beat 4 of bar 4 actually owes something to one of James Taylor's blues songs more than anything else. It's remarkable the variety of influences that can come into play when a group is jamming-up a tune. As we come down in volume for what is labeled as [A2], the texture opens-up, and I am simply playing the most basic natural harmonics at the 7th fret with the subtle usage of my tremolo arm, the "soul stick" as some folks like to call it. This would be the only time that this section appears in the piece! From there, we move on to [A3] which serves as a 3rd melodic section, and it is, perhaps, the most singable of the three. That's kind of a sad statement right there, because this is hardly much of a memorable melody. But, yet again, the spirit and the groove created by Anthony, Steve, and Manolo somehow makes it work. This particular melody is played near the open strings, and is articulated by snapping the strings with the fingernail of my index finger. Again, the last note is given a slight dip of the tremolo arm. From here, we repeat [A] and then skip right to a reprise of [A3]. Though I don't recall the specifics of how we organized the piece, my sense would be that this was a Steve Jordan suggestion. At about the 4:00 mark, we finally arrive at [B] which recalls the texture of our [I] section, except this time, we are in an F# Phrygian sonority, or Em6(9)/F#. As yet another crescendo builds, you can hear Anthony's beautiful usage of space, as he mines the lower register of his then first experiments with a design of his Contrabass Guitar. What Anthony brings to the table contributes mightily to the other-worldly nature of this kind of texture. 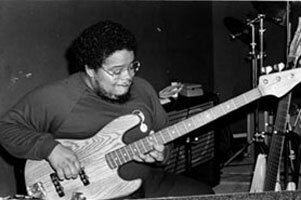 At this point, it's probably important to note that Anthony Jackson's spectacular contributions to the [C] sections of the tune became the reason that I decided to rewrite the lead sheet, and try to more accurately notate what he had played. Perhaps, other than bar 8 of each section, I had felt that the entire melody that I had composed, first in 6ths for [C], and then in block chords for [C2], could have functioned perfectly well over an F# pedal. However, Anthony heard other sonorities, and thank goodness for that! Even in bars 1, 3, and 5 of those sections where, in my view, there should be an F# coming from the bass, you could make the case that Anthony's low open B-string becomes more of a principal note than any F# that appears. What is remarkable to me is how he hears 'G' as his choice for bars 2, 4, 6-7 of [C], but as the harmony expands for [C2], Anthony's ears open-up, and other harmonic possibilities entered into his fertile imagination. In bars 2, 4, and 6 of [C2], he contrasts the 'G' with low Eb's, and in bar 6, he substitutes a 'D' for the 'G' and presents a completely different harmonic option to the exact same voicing from me. On a personal level, Anthony and I have had our difficulties and disagreements over the years, and many, many people have asked me, "Steve, how can you put-up with some of the things that he does?" Well, when you look at what he contributes to sections like this, to me, it's hard to imagine that any other electric bassist would have gone down a similar path. Acoustic bassists? Yes, they hear such things readily and easily, but that's a very different sonic choice for me, especially when difficult travel is involved. As the two [C] sections come to a close, and we land on a D/E sonority, or E7(9sus), Anthony comes out of playing C to A in bar 8 of [C2], but as we land on letter [D], instead of the 'E' that I was expecting, he plays a 'B' which sounds wonderful, and makes beautiful melodic sense coming from the prior two notes! I think that when you analyze what Anthony has done throughout these sections, it becomes a wonderful example of melodic and creative bass playing. It's also important to note his usage of register displacement which I find unique to his approach to music-making on his instrument. The [D] section is really an 8-bar set-up for the coming guitar solo. The usage of the guitar's natural harmonics at the 7th-fret are a reminder of the texture from [A2]. As we arrive at [D2] and the guitar improvisation begins, I decided to transcribe what Anthony played underneath me during the 1st 4 bars. From my point-of-view, I wanted to hear lots of E's and B's, which would have enabled me to guide the musical conversation in any number of directions over time, but, as you can see from the activity of what Anthony was hearing, I seem to have been pushed down a different path. His usage of F#'s alludes to his approach to the [A] melody sections, but to include a C-natural in such a prominent spot was difficult for me. Though you will not hear much of the solo during the provided soundclip as presented here, if I was going to be extremely self-critical, I can hear that I was struggling to gracefully execute much of what I was hearing at that time, because of the awkward transition, at least for me, from the fingerboard of a Gibson ES-335 to the scale and spacing of a Fender Stratocaster. My playing lacks a kind of grace, and just sounds clumsy to me. After playing the Gibson for most of the set, this change of instruments was always difficult for me. It was not until I had spent some time with the great Bill Connors between '84-'85, when he explained to me, in terms that I could finally understand, I knew what the problem had been. He suggested two things:  I should have been playing on a neck that had a flat fingerboard; and  I needed to buy a DiMarzio bridge with Gibson spacing. I did both of these things, and all of my Strat-type guitars now have those bridges. It made a huge difference to me, and how the instrument now feels under my left-hand. Back to the solo section, this becomes an example of why Anthony and I would experience musical friction, because what he was hearing tended to push me into areas where I was not expecting to have to go. If you look at it one way, what's so bad about that? But, there were times when I just couldn't view it that way. One of the principal elements of good music, and good music-making is the usage of dynamics, using a broad range of dynamics seems so simple, but this is often lost in the pursuit of other things by other groups. Within the context of Eyewtiness, this element never needed to be discussed, because we all just gravitated towards the most musical decisions where this element was concerned. And so, as the tune arrived at [B2] after the guitar solo, there is an immediate and radical drop in volume, and we return to the mysteries of the F# Phrygian sonority. A gradual 8-bar crescendo leads us to a reprise of both [C] and [C2], and Anthony's approach to these two sections also forced me to present this revised lead sheet here, because he continued to create new harmonies and, as you'll hear, his ESP-like rhythmic communications with Steve Jordan provided a brilliant wrinkle in [C2] that foreshadowed their approach to the [E] sections that were to follow. The added punch and power from their syncopated 16th-note activity in bars 2-3 and 4-5 gives the section a lift that, if I had spent one month trying to think of something for them to have done there, I never would have come-up with anything remotely as brilliant!!! 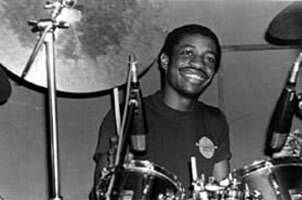 You also have to consider how meticulously Steve Jordan tuned all his drums, and the sound of his kick, his snare, and the tom-toms was just spectacular. Little moments like this account for just why so many bassists and drummers revere these recordings! Once again, at letter [E], the band comes down in volume and another section of crescendo begins. Here, the melody has taken on a new rhythmic shape and harmonic contour as you now hear the harmony moving from the very Phrygian sounds of Em6/F# in bars 1, 3, and 5 to F#° resolving quickly to F# major during bars 2, 4, and 6. With the hard and very physical accents in bars 7-8, Anthony and Steve shoot us into [E2] with their syncopated 16th-notes in full flight as A.J. 's melodic bass lines serve to heighten the ingrained tension of the Em/F# sonority. Again, pay attention to his register displacement during the 1st 5 bars of the section. There is no substitute, in the right moment, for blasting away at full power, which is exactly what you hear from Steve and Manolo. Once again, I am certain that Steve Jordan made the suggestion that we have to repeat [E2] to drive the piece home. It makes perfect sense! Steve always had great instincts about how to refine structures, and move a piece of music along. He trimmed a lot of excess that I probably would have left in. As the section closes out, we are ready to D.C., and go back to the top!!! Arriving back at [I] and the Am6/B Phrygian sonority where it all began, the band completely drops down in volume as, this time, the section is only 8-bars long, but a sufficient amount of time for a crescendo into the reprise of letter [A]. But this time, to drive the tune to its conclusion, we play the section 8 times, twice as long as before. Somehow, in this last section, the insistence of Steve's 4-on-the-floor kick drum really gives the song a Police-like flavor. You'll notice that, as the 5th repeat begins, Steve added a slap-repeat to his snare drum in post-production, that was totally his idea. I recall that he heard something that he didn't like and this was the best solution to 'blur' what had happened. I also love how, on the 2nd time through, in bar 3, on the and-of-2, Anthony goes down to a low 'D' in place of the 'B' above that he had always played in this section. He repeats this maneuver during the 4th time through as well. Again, he has such a unique sense of spontaneous harmony. Though you won't hear it on this edited soundclip, the tune ends on the and-of-2 in bar 3 during the 8th repeat. It should also be noted that the voice that you hear in the background during the [A] sections belongs to Steve Jordan. He heard something vocal there, but I don't know that I was ever willing, back then, to put in the time to refine his ideas into something that, in my view, was actually usable. Looking back, in all honesty, I now believe that he was onto something, but we didn't really know what it was. I know that I hear the R&B influence in what he was singing, that's for certain. 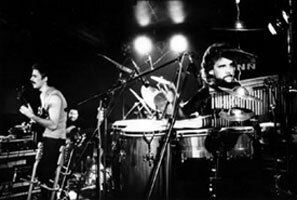 In an ironic twist, the band actually contained a great voice, and unbeknownst to the rest of us, it belonged to Manolo Badrena. We didn't realize how great he could sing until the mother of invention, necessity forced this great talent of his to be discovered as we were preparing the music for "CASA LOCO" later that same year. I wonder what Manolo could have added to this tune had I only known then what his voice was like? I would like to extend my most sincere thanks to everyone at both Universal Music in Japan, and here in the USA for coming together and making possible the simultaneous releases of: "MODERN TIMES"('82); "LET'S CALL THIS"('91); "HEADLINE"('92); and "CROSSINGS"('94). They are finally available to everyone, worldwide, via iTunes and other services for legal digital downloads. It has been a sad reality for me to have endured so many years of listening to the frustrations of so many fans of these recordings that they just could not locate them anywhere, nor in any format. As we are on the precipice of the end of the "CD ERA," knowing that the important recordings in my catalog are now all available has really served to brighten my spirits for 2014 and beyond. My thanks to everyone who has written me over the many years, and expressed their support for this music and these recordings. Thank you all so much!! !